Lowest Prices for the best trailer cargo organizers from Rackem. Rack'em Back Pack Blower Rack for Enclosed Trailers part number RA-4 can be ordered online at etrailer.com or call 800-298-8924 for expert service. 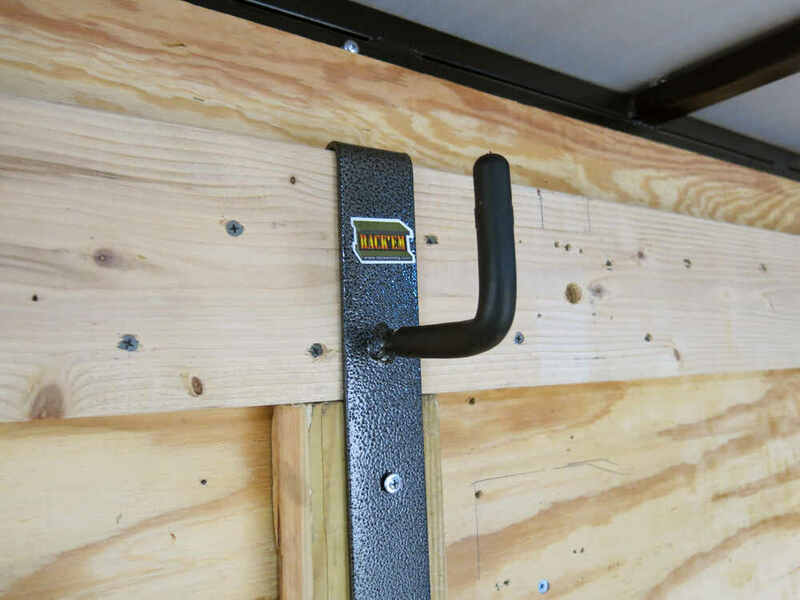 Enclosed Trailer equipment racks feature a hook design at the top of the rack that allows them to hang from the metal frame runner at the top of the side walls on the trailer for added strength. 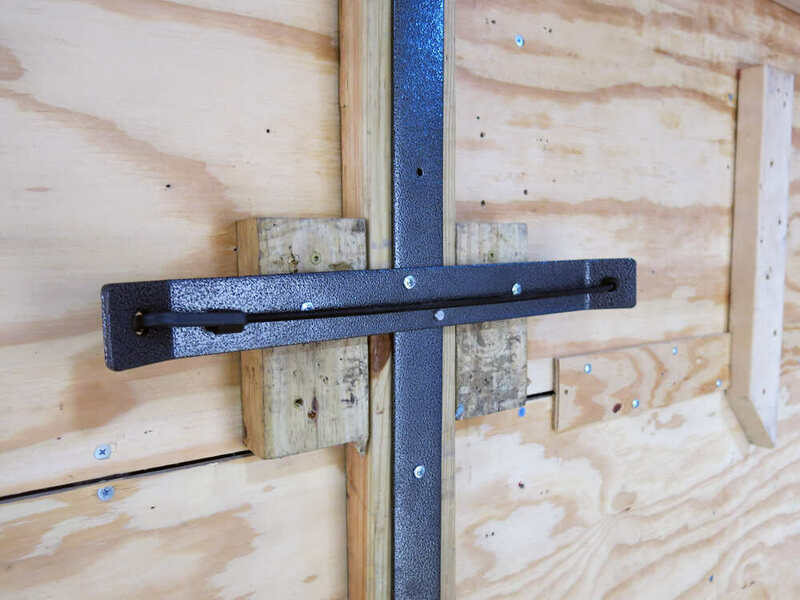 They are pre-drilled so that they may be screwed securely to the wall. Today we're going to be taking a look at the Rackem backpack blower rack. 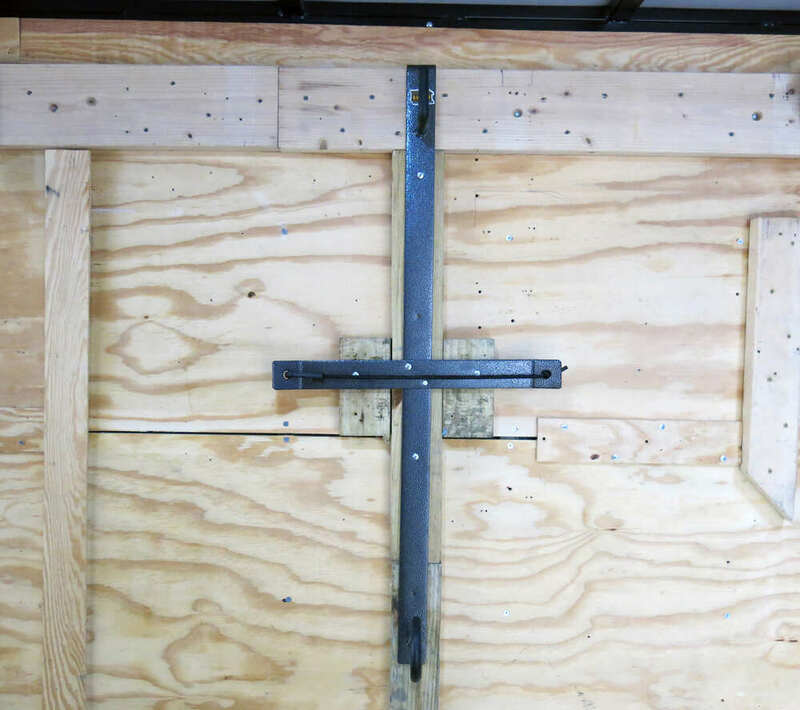 This has been designed for use in enclosed trailers. The part number on it is RA-4. The rack's going to offer a nice durable powder coat finish. It's got kind of a gray and black hammered look to it. It's really sleek-looking. We've got heavy duty hooks, one located here at the top. 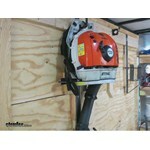 This is going to be for the top handle of your blower where it will fit down on. Then we've got our middle section here. A couple little kickouts here on the each side to help hold that blower centered, and also a bungee cord that will come over and connect in. 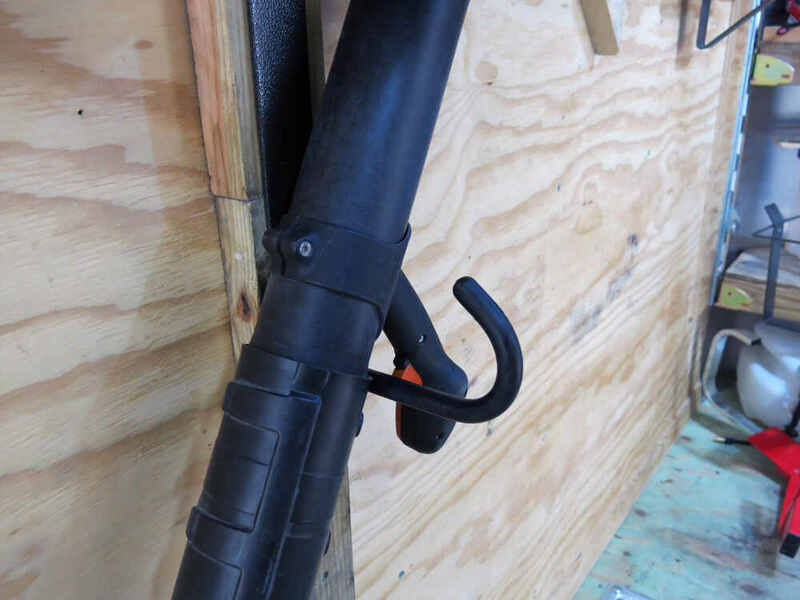 That gives us a nice secure all-around hold for our blower. Then we've got one more hook located here down at the bottom. Now this can be used for a few different things. 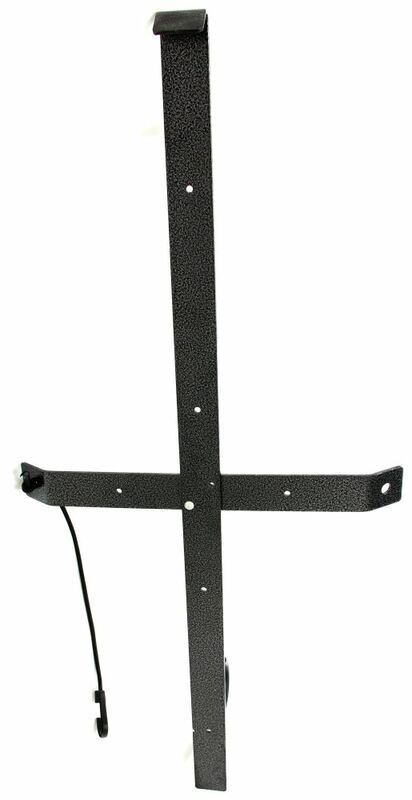 You can use it to hang some of your accessories or whatever you might want to on it. 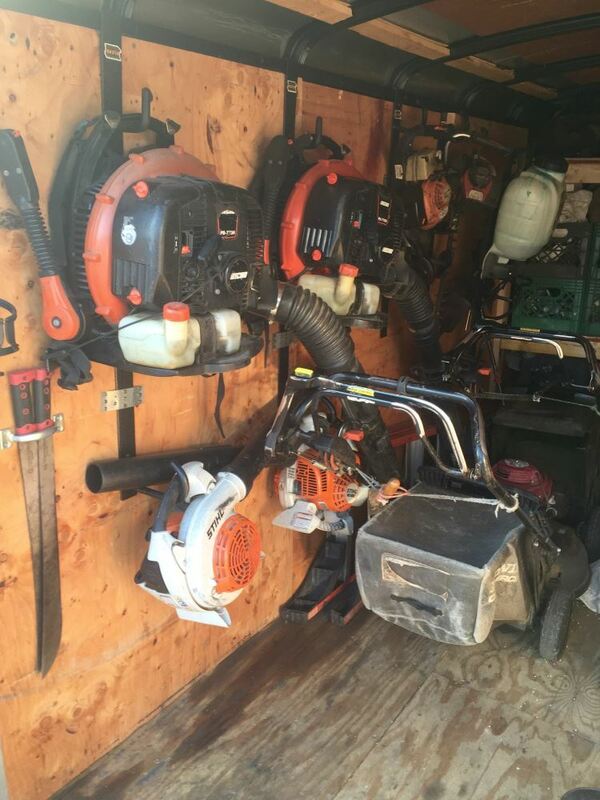 But these backpack blowers, as I'm sure you guys know, sometimes those hoses like to stick out and just be in the way all of the time. 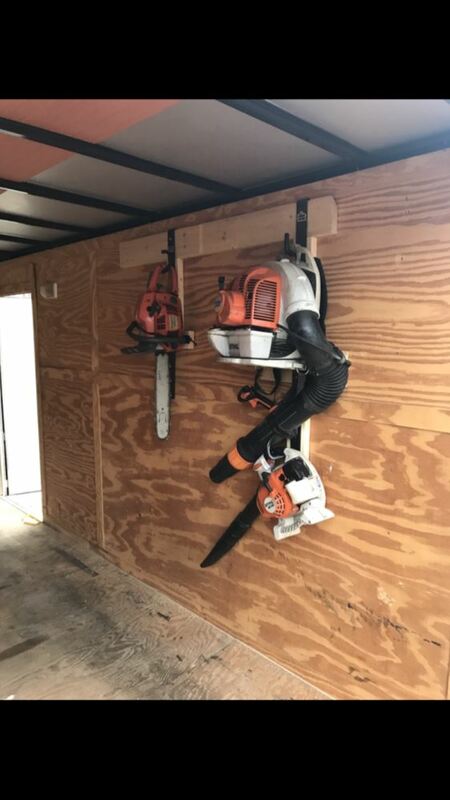 This gives us a spot to where we can let that hose come down, hang, and we won't have to worry about it flopping around as we're going through traffic. 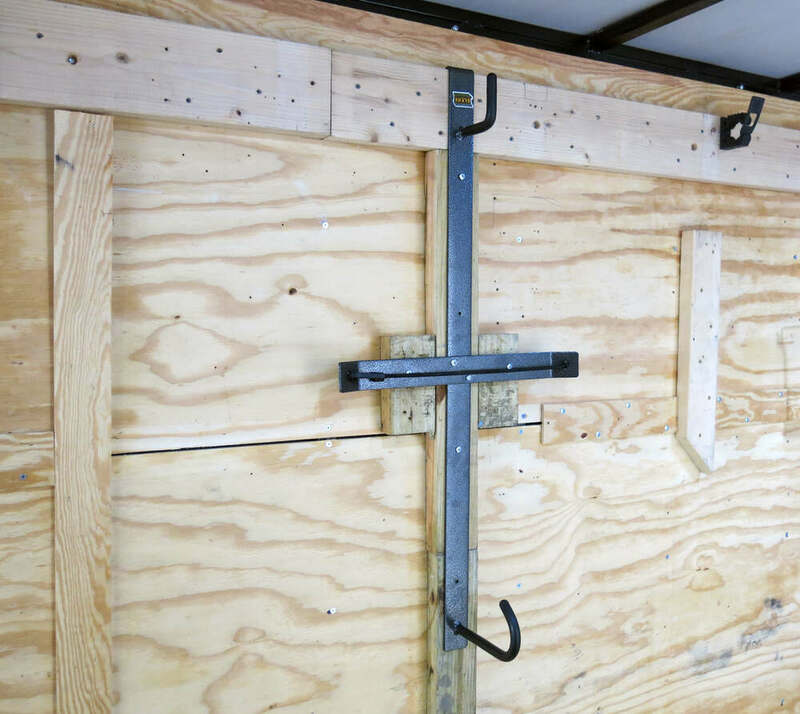 Now that we've gone over some of the features of the rack, let me show you how to get this installed into your trailer. 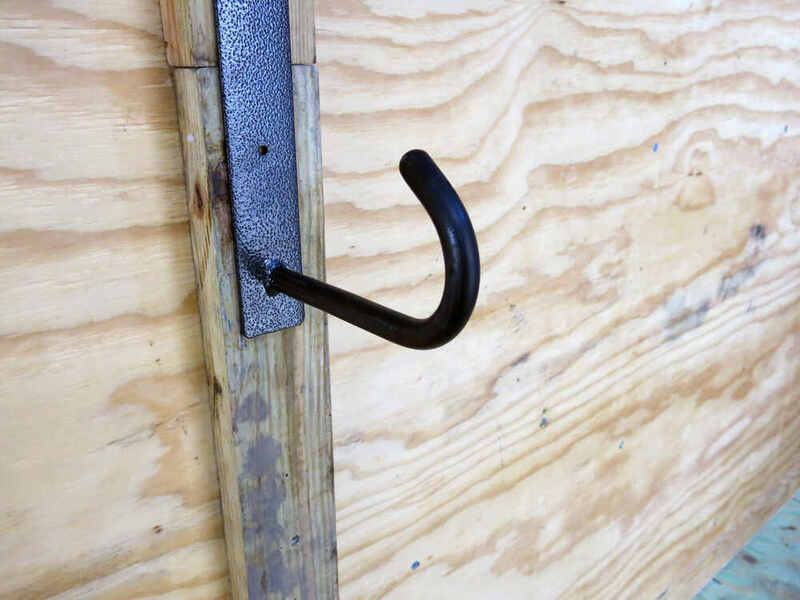 As you can see, we've got a nice larger hook here. Typically for the rounded top enclosed trailers that's going to be made to go right over the top edge here into that frame runner of that rail that runs up and down. Now in our case we're using a flat top. Right behind this board we've got wires that run the length of the trailer. We certainly wouldn't want these coming over there, hitting into our wire. Plus, you can see it's not the thickest plywood in the world that they've used. What we've done is we've taken a 2x6. You can see it here. Beveled the backside of it, and that allows us for a perfect fit when our rack and products are slid down on top. Let's just take our screws and start putting them in. Please keep in mind, the hardware is not provided. All right, let's place our blower in now that we've got our rack installed. Just want to tilt it in at the top and allow it to roll down. Then we're just going to bring our bungee on around. You certainly don't want your bungee to be resting on any of your cables or anything like that. I also wouldn't recommend running it across any kind of fuel filler, your handle or choke tube, anything like that. As you can see there, we've got our blower installed nice and solid. It's not going anywhere. Our tube tucks in nicely down here on our lower hook. That will complete today's look at the Rackem backpack blower rack, part number RA-4. . 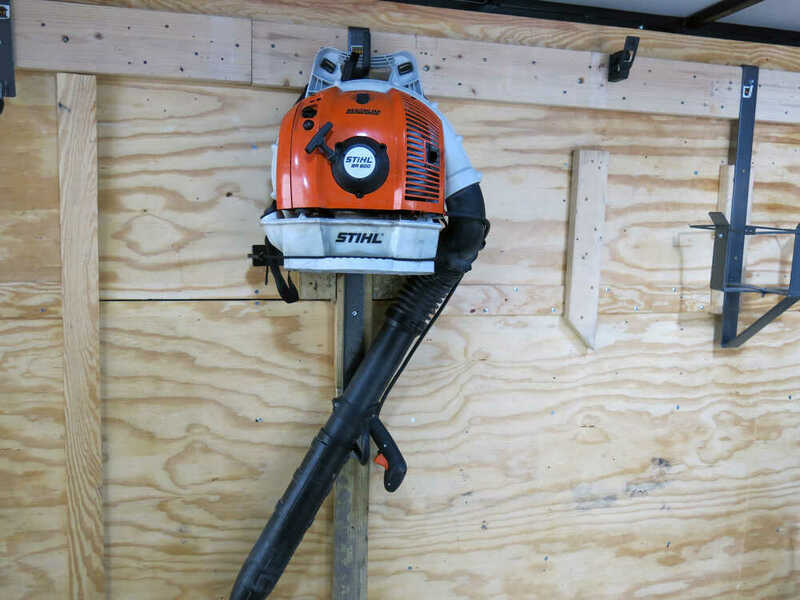 There are adapters available for different model Stihl backpack blowers. Check the Related Products section above. 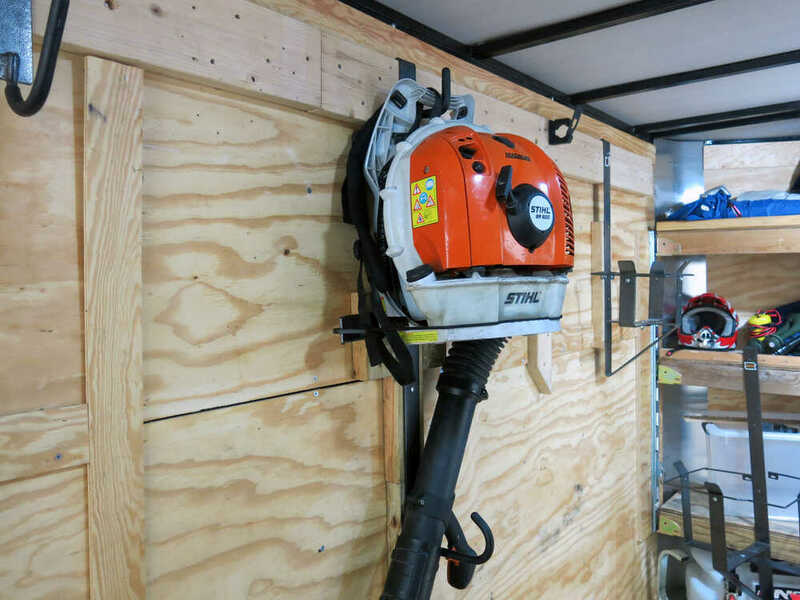 The Rack Em Backpack Blower Rack measures 41-3/8 inches tall, and 19-3/8 inches wide. 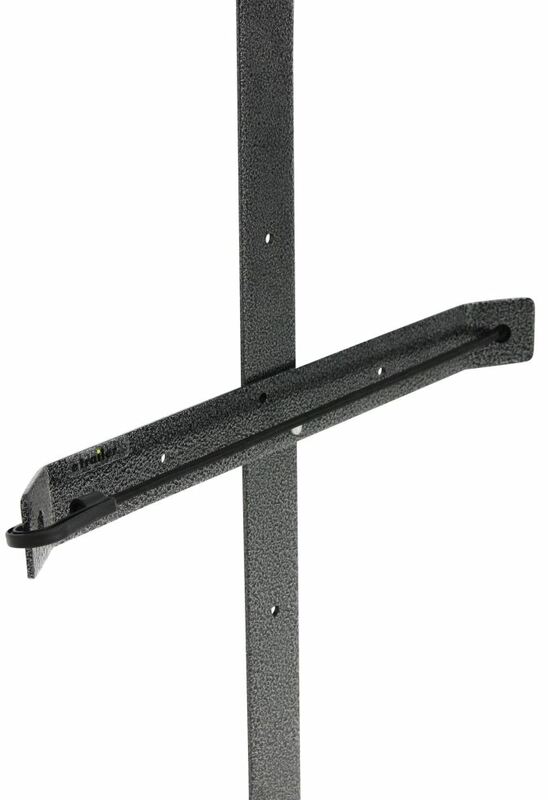 Measuring from the top of the rack downward, the mounting holes are at 7-1/2, 17-3/8, 27-1/4 and 37 inches. 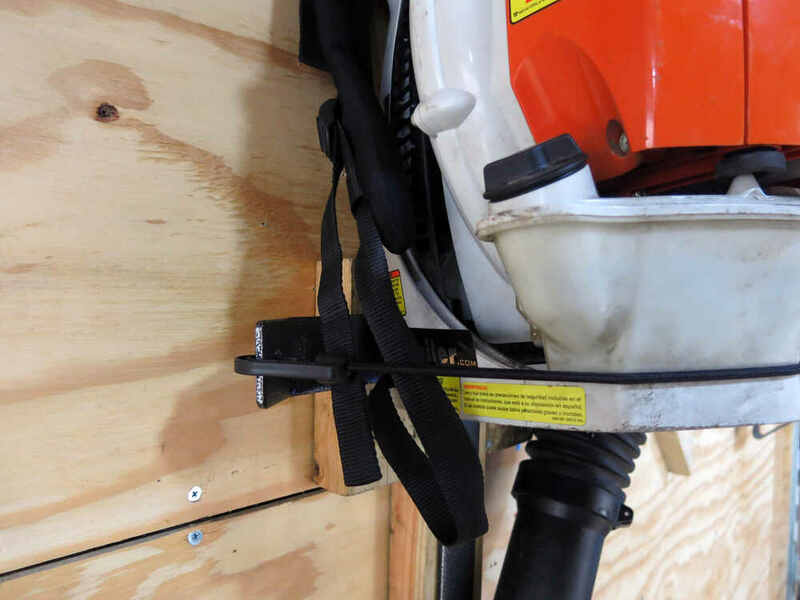 The distance from the hook at the top of the unit down to the bungee strap used to retain the blower is 17 inches. I have produced a short video showing these dimensions for you. Yes, I looked up pictures of your Redmax 8500 blower and the handle on the top of it would easily hook to the top hook of the Rack'em Back Pack Blower Rack # RA-4.